Vestmannaeyjar (the Westman Islands) is an archipelago located off the mainland’s south coast. Heimaey, the main island, is home to around 4,100 people and can be reached by a short flight from Reykjavik, or a ferry. With its small white houses and brightly coloured roofs, the picturesque town has a unique atmosphere and is known for the annual National Festival which celebrates Iceland’s thousands of years of history. Being almost entirely free from light pollution the islands are perfectly placed to catch the northern lights because of the strong solar winds that pass over the islands, bringing the lights with them. Herjólfsdalur is a valley surrounding Vestmannaeyjar, with scenery that is beyond beautiful. This is where the first settler on Vestmannaeyjar made his home, and archaeologists have found what is thought to be his house. A replica was erected at the spot. 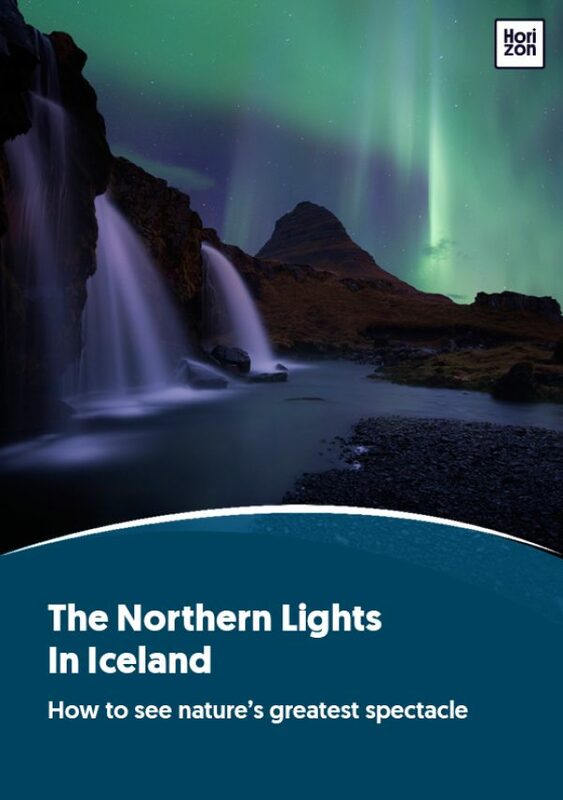 It’s a unique setting and as you can imagine, with no light pollution to distract from the northern lights. There is open access all year round. Stórhöfði is also just outside Vestmannaeyjar at the extreme south of Heimaey, a 10-minute drive in a 4x4 vehicle. This is public land with open access, and again, there is no light pollution to spoil your view of the northern lights. Eldfell is a dormant volcano, a 30-minute drive from Vestmannaeyjar. This is one of the highest points on the island with the best views of the skies. Again this is open access land with no light pollution. But it can be steep and in the autumn and winter it can be slippery underfoot. There is probably less light pollution here than anywhere else in south Iceland and Heimaey is perfectly placed to see the northern lights. Strong winds can have the effect of blowing the aurora across the island–although the winds can also make it difficult to track the lights. Almost all the island is open to visitors. However, because of its remoteness you will need an off-road vehicle to get almost anywhere outside the major settlement. There are few guesthouses, shops, and other amenities. Skansinn Church is a replica of the first wooden Viking church in the country, and was donated by the Norwegian Government in the year 2000 to mark 1,000 years of Christianity in Iceland. The church is located next to the harbour, on Heimaey Island. Elephant rock as its name suggests, is a huge rock near Vestmannaeyjar which looks remarkably like an elephant, and the surface of the rock gives an uncanny impression of the animal’s wrinkled skin. The rock can be found behind the golf course, at the end of Halldórsskora cliff. The best views are from a boat in the waters surrounding Heimaey. Stórhöfði is a rocky peninsula at the southern end of Heimaey, allegedly the windiest place in Europe. There is nothing here other than a small weather station and birds, but that’s not necessarily a bad thing.